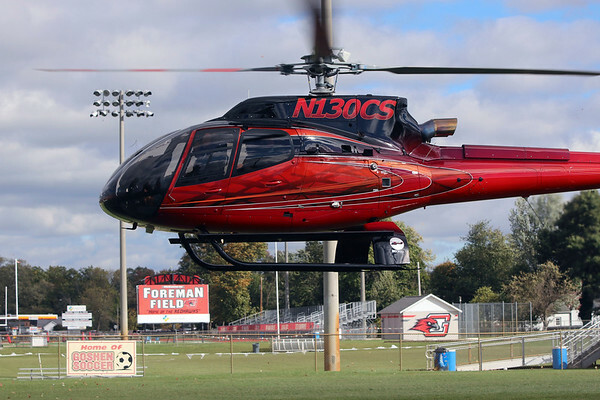 Goshen City Council youth adviser Felix Perez Diener, a Goshen High School senior, and those who also ran for the seat — Ben Bontrager-Singer, Cade Richardson and Jonathon Snyder, all seniors — land on the Goshen High School soccer field in a helicopter piloted by Randy Sharkey Wednesday afternoon. The ride was the final part of the students' day during which they were picked up by Mayor Jeremy Stutsman and taken to various city departments to meet with representatives before eating lunch together. Stutsman said the end of the day, like last year, culminated in a helicopter ride around Goshen "so they can see it from up above."